As for Naruto Online game, Roshi [Four-Tails Jinchuriki] is one of the strongest Ninja with amazing skills. Taijutsu, Ninjutsu Burning Ocean [Prompt]: Destroys all barriers and will cause Fire and Earth attributes damage 9 units of the opponent’s field. A selected unit will suffer from Knockdown. Taijutsu, Ninjutsu Taijutsu Attack: Attacks the opponent’s units in the front row and has a fixed chance of causing 4 COMBO and Low Float. Ninjutsu Lava Style- Scorching Rocks Jutsu: Triggered with at least 30 COMBO, attacks 4 of the opponent’s units Fire and Earth attributes damage and will cause the units to suffer from Ignition. Ninjutsu Armour Melting: Every this this units suffers Taijutsu damage, the attacker will suffer from Ignition, moreover, this unit’s Defense and Ninjutsu will be increased. Ninjutsu Tailed Beast Chakra: Before the first action in a round, recovers Life points based on this unit’s Ninjutsu attribute. Becomes Immune to all Debuffs. You can get Roshi [Four-Tails Jinchuriki] from the Jincuriki Treasure 1. It will take almost 180-220 seal scrolls draw to get Roshi. However, I’ve seen Roshi fragments available on certain events like Lucky Stars Wheel. 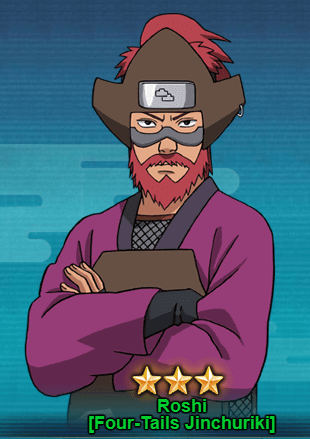 Maybe you might get chance to get Roshi [Four-Tails Jinchuriki] fragments using coupons on some of the weekly events.